Azerbaijan’s government is raising wages and pensions in an effort to ease the pain of rising prices and a sputtering economy. The reforms are part of a package of economic aid that, analysts warn, risks adding to the inflation. The country has struggled to recover from the economic crisis of 2015 and 2016, when oil prices dropped and the central bank was forced to drastically devalue the currency. On April 1, Baku raised the minimum monthly pension from 73 manats to 130 manats (about $43 to $76). A month earlier, it boosted the minimum wage from 130 manats to 180 manats (about $76 to $106) per month. Also in the last two months, the government has promised compensation for borrowers who suffered from the manat devaluations, as well as relief for overdue debts held by families of people killed in the war with Armenia. “The government has a political interest to present the inflation rate as low and the income as high,” Ibadoglu said. One small shop owner in Baku, Naila Mahmudova, told Eurasianet that the wholesale prices she pays for produce have spiked. “We used to buy onions for 40 qepik [per kilogram], and it became 1.5 manat a few days ago,” she told Eurasianet. “Potatoes became 1.5 manat, it was 80 or 90 qepik before. Everything has become expensive,” she said. "Everything changes in one day, you don't know what will happen tomorrow." The high inflation comes even as Azerbaijan’s economy continues to lag behind its neighbors’. According to data from the Asian Development Bank, Azerbaijan’s 2018 GDP growth of 1.7 percent was lowest in the Caucasus and Central Asia. The bank projects two percent growth in 2019, also the lowest in the region. The research company Fitch Solutions has a slightly rosier outlook for Azerbaijan – 2.5 percent GDP growth this year and 2.9 percent in 2020. “That said, our forecasts imply that growth will remain well below pre-crisis levels, as well as below the rate needed for the country to converge with more developed peers in Europe,” the company said in a March 13 statement. The Ministry of Economy did not respond to requests for comment from Eurasianet. 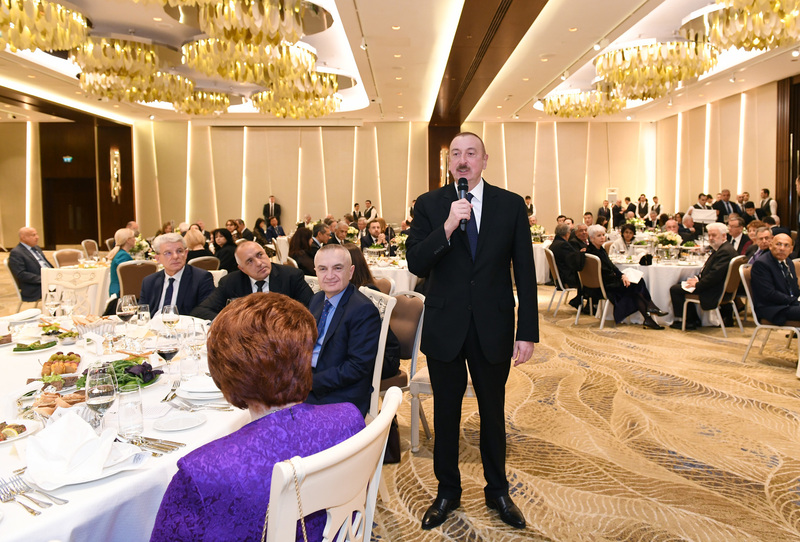 In its public statements, the government has presented the aid packages as part of an economic reform agenda that President Ilham Aliyev has been carrying out since winning a fourth election last year. While the government has announced reform proposals like streamlining the tax system and introducing a mandatory health insurance program, observers say the implementation of those reforms is spotty. That leaves the increased social payments as the most tangible moves the government has made. “For me, these are not reforms,” Ibadoglu said. Nevertheless, they have been welcomed by beneficiaries. Rasim Babayev, a teacher in Baku, got a dollar-denominated loan for $1,500 in 2015 after the first devaluation. But when the second devaluation happened, “it became very difficult to pay the loan back,” he told Eurasianet. After struggling for years to repay the loan, and getting his salary docked, he still owed 1,000 manats. “After the president made the decree, I was told the debt issue is resolved and I will get an extra 170 manats in compensation,” he said. “It is very important for people in situations like mine. 1,000 manats is big money for us. So now it is over and we can relax." Babayev said he also struggles with high prices – cigarettes that used to cost one manat now cost 1.5 manats. But he is slated to get a salary increase at the end of April. "At least it compensates for the increase in prices,” he said. The increased payments, however, risk fueling the inflation they are designed to address. The government has budgeted 335 million manats ($197 million) this year for the minimum wage increase alone, though Ibadoglu estimates that the total aid package will cost the government three times more. Indeed, the financial payouts come as the government has appeared increasingly sensitive to discontent. In January, it reduced train fares to the country’s second city, Ganja, after a social media outcry. And after an unexpectedly broad public reaction to an attempt to extend the sentence of a young political blogger, it backed down on the sentencing and then released more than 50 political prisoners. One of the 50, however, was re-arrested just two weeks after the pardon. “So, the ‘reforms spring’ diplomats in Baku were so excited about seems to be over,” wrote journalist and former political prisoner Khadija Ismailova on Facebook. With additional reporting by Durna Safarova. Joshua Kucera is the Turkey/Caucasus editor at Eurasianet, and author of The Bug Pit.